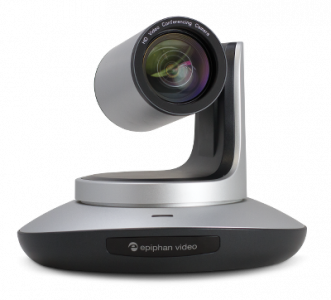 Capture 72.5° wide view of your event at 1080p with Epiphan’s PTZ camera. RS-232 communication using VISCA, PELCO-P and PELCO-D protocols. Ensure every detail is visible when shooting in varied or difficult environments with sharper, more accurate 3D Digital Noise Reduction. Keep your viewers glued to the screen with crystal-clear video in beautiful Full HD at 60 frames per second. Prevent overshooting and reduce manual operation required to produce a live event by saving your favorite camera settings to any of the 128 possible presets. Use the remote control to create and apply custom presets for simple and error-proof camera operation. Recall and apply your PTZ camera presets with the convenience of the touch of a button enabling easy camera operation for non-technical staff for a flawlessly simple live production experience.